Are you preparing for GATE 2018? Looks like you are really interested in a career that is too colorful and gives you a lot of opportunities to shine like a star. Of course, concentrating and dedicating yourself to studying is one of the most important tasks that you need to be doing right now. But, we have something more to help you achieve great marks in your GATE 2018. We will take you across some of the DO’s and DONT’s of GATE and also we will provide you with some simple tips to hep you achieve success. What are the DO’s of GATE? A general tendency of candidates is to focus only on that subject that interests them. Of course, you need to be studying what you love. But do not forget the other subjects that do not interest you. In fact, the other subjects do carry equal weight-age. When it comes to the people who set the question paper or your examiners they will not be liberal. All that matters to them is how you prepared all the subjects and your score in all these. It needs to be a fair game. Time and again, you might have been told by your faculty at the GATE coaching centers in Cochin that you need to refer previous year papers. 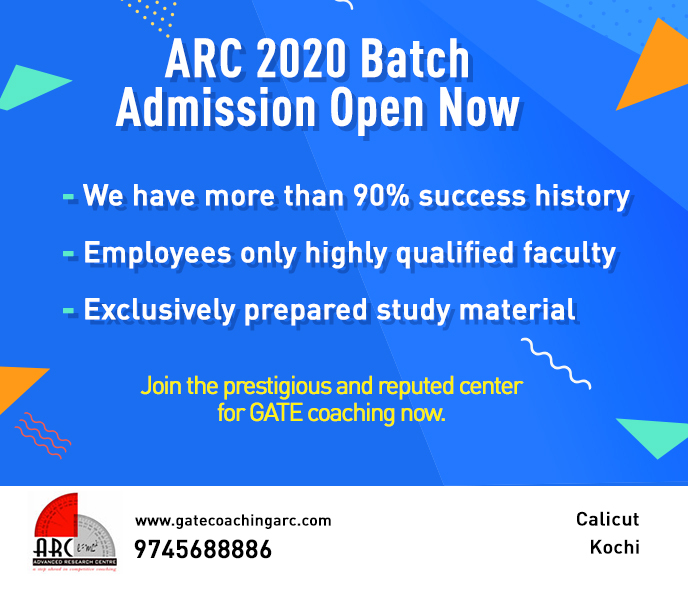 As far as your coaching center is concerned, if you have enrolled into one of the best GATE Coaching centers in Calicut then they will provide you with ample of previous year question papers that will help you prepare well for the hurdle that lies ahead. Choose the topics that appear frequently in subsequent GATE question papers. We cannot push aside the possibility that these will not appear again in GATE 2018 question paper. So, let us not miss out a chance and later brood on what we missed just because we did not prepare well. Check online for the date of commencement of GATE exams in 2018. Now you will know the number of days left ahead of your GATE exam. Plan and schedule your time-table accordingly. Don’t miss even a single moment. As we already specified before each of the subjects needs to be prepared well. So, allot equal time for all subjects especially for ones that are tough for you. Revisions are the most important part of any examination. So, find time to revise and then work on the topics that you have been struggling to learn. Revision time is the best you can utilize to learn well all that you have studied till now. If there were portions that you kept aside to learn later, you can study these during the revision time. Another thing is learn all your formulas well. All the problems are based on simple formulas. You just need to learn them and the rest will happen automatically. Once you have covered all the portions and revised everything, test yourself. There is no stage as to learning everything. However, hard you try to learn things, it is incomplete. Whenever you check the previous year’s question papers you will realize you have left out something or the other of importance. So let’s not take a chance. The best way is to put yourself to test and then analyze where you are struggling. Don’t fret if you have not completed all the portions. Don’t try to load your memory with a lot of things just before the exam. If there are a lot of things in pending, it is good to prepare just the ones that you have done well with little time left. Students take a pleasure in walking around with loads of books from favorite authors and the truth is none of us actually like reading through all of them. To be honest, it is not your fault. It is mere psychology. We get attracted to something that is in bulk but are not ready to work on what lies inside. It is a general tendency of students to start panicking as the number of days to the exam date starts decreasing. This can deviate your thoughts from your studies and you might even start getting nightmares of failing in your exam. It will be easy and you will easily crack through. You have reached here because you have the caliber and GATE is something that many of the students have already cracked and you will too. ARC Foundation is one of the best GATE coaching in kerala. We have a legacy of training aspiring candidates to help them crack GATE and CAT examinations.